Ukraine has passed to the market economy after gaining its independence from Soviet Union in 1990. Ukraine is one of the world's most important mineral producing countries, in terms of both the range and size of its reserves. There are nearly 8,000 separate deposits, harboring some 90 different minerals, of which about 20 are economically significant. About half of all the known deposits are under exploitation. Coal reserves in Ukraine amount to 47.1 billion tons. The annual domestic demand for coal as fuel is about 100 million tons, of which 85 percent can be satisfied by domestic production. Ukraine is rich in mineral deposits, including iron ore, manganese ore, mercury, titanium, and nickel. It has a major ferrous metal industry, producing cast iron, steel and pipes. Among its economy leading companies in that field are Metinvest, Kryvorizhstal, AzovStal, Ilyich Steel & Iron Works, and others. As of 2012, Ukraine is the world's tenth largest steel producer (according to World Steel Association). Agriculture is a large part of Ukraine's economy. Ukraine is the world's largest producer of sunflower oil, the 3rd largest corn exporter in the world, a major global producer of grain and sugar, and future global player on meat and dairy markets. It is also one of the largest producers of nuts. Ukraine also produces more natural honey than any other European country and is one of the world's largest honey producers, an estimated 1.5% of its population is involved in honey production, therefore Ukraine has the highest honey per capita production rate in the world. Ukraine exports mainly steel, coal, fuel and petroleum, chemicals, machinery and transport equipment, grains. More than 60% of the exports goes to other former Soviet Republics countries with Russia, Kazakhstan and Belarus being the most important, Turkey and China. 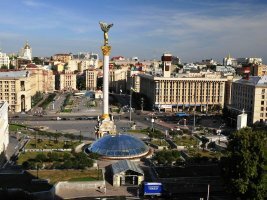 The economy of Ukraine is an emerging free market, with a gross domestic product that fell sharply for the first 10 years of its independence from the Soviet Union, then experienced rapid growth from 2000 until 2008. Natural gas is Ukraine's biggest import and the main cause of the country's structural trade deficit. Main industries in Ukraine are power generating, fuel, ferrous and non-ferrous metallurgy, chemical and petrochemical and gas, machine-building and metal-working, forest, wood-working and wood pulp and paper, construction materials, light, food and others. Ukraine's dependence on Russia for energy supplies and the lack of significant structural reform have made the Ukrainian economy vulnerable to external shocks. Ukraine depends on imports to meet about three-fourths of its annual oil and natural gas requirements and 100% of its nuclear fuel needs. Ukraine's top imports are petroleum gas, refined petroleum, cars, packaged medicaments and coal briquettes. Main import partners of Ukraine are Russia, China, Germany, Poland and Belarus. 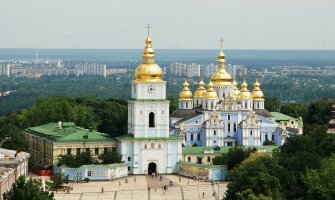 Ukraine is a country situated in Eastern Europe, bordered by Russia, Belarus, Poland, Slovakia, Hungary, Romania, Moldova, the Black Sea and Sea of Azov. The country has long been a global breadbasket because of its extensive, fertile farmlands, and it remains one of the world's largest grain exporters. Ukraine is a member o the Black Sea Economic Cooperation Zone, International Chamber of Commerce, World Customs Organization, World Trade Organization and other international organizations. The import duty is based on the CIF value of goods. Apart from import duties, importers will also have to pay a value added tax. The VAT is generally levied on goods and services at 20%, calculated on the Cost, Insurance and Freight (CIF) value plus import duty. Special VAT regimes apply to certain goods. There are excise duties levied on food, beer, wine, spirits, tobacco and fuel. Additional documents may be required depending on the goods and the means of transportation. Import controls are in place for certain products. There may be pre-shipment controls on imports of manufactured products. Customs clearance of goods (regular export-import documentation) is required by the Ukrainian authorities when transporting goods between mainland Ukraine and Crimea. Customs clearance is carried out at border checkpoints with Crimea. There are around 80 customs points across Ukrainian border - all international air and sea ports, railway and road border crossing points. Every customs point covers a particular geographical area. The importer must within a ten day period render to the customs authorities the full package of documents. Declaring of any export-import operation is performed by issuance and submission to the Customs authority a special form - Cargo Custom Declaration. The Declaration is a unified document, which provides necessary description of the cargo, its price and customs value, information about exporter (importer), which is a party to the supply contract, broker (declarant), consignee, customs authority which performed the customs clearance, means of transportation, a list of all commercial and shipping documents related to the cargo, describes payment of all custom duties and charges related to the export-import of the commodity.